Lot:5020 Friedberg 97 (W-1277). 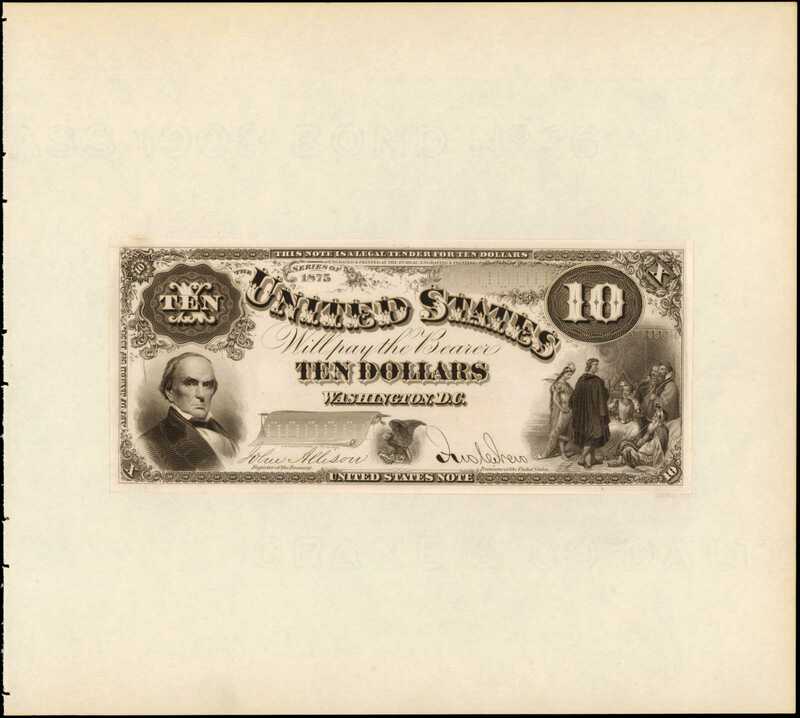 1875 $10 Legal Tender Note. PCGS Currency Very Choice New 64. Face Proof. Friedberg 97 (W-1277). 1875 $10 Legal Tender Note. PCGS Currency Very Choice New 64. Face Proof.Hessler-Unlisted. Printed on India paper, mounted on wide margin paper. Imprint of the Bureau, Engraving & Printing. Black and white portions of the face only. Titles and obligations across the center. Lower left, Daniel Webster. Lower right, Pocahontas presented to the Royal court in London. Bottom center, small eagle that inverted creates the so-called "Jackass" feature. This image was also used on Fractional Currency shields. Engraved signatures. Zero numbers perforated in both serial number blocks. A fascinating face proof of a key type note, as this Friedberg number is truly rare in issued form as well. Here is a gorgeous impression, well centered with trivial wrinkling. The perforated numbers land perfectly on the shaded portions. Formerly part of the outstanding proof archive sold by Stacks in the September 2010 Americana Sale.From Stacks Americana Sale, September 30-October 2, 2010, lot 1064.